Yes! You can shop with Extang with confidence. We work with Stripe.com which offers safe and secure credit card transaction for our customers. Stripe is Payment Secure and PCI Compliant that follows all protocols with sensitive customer data. Due to items being built on demand for your specific YMM your credit card is charged at the time of your order. If you wish to cancel at anytime or order an alternate product please contact sales. Please make sure the billing address that you entered on our site matches what your financial institution should have on file. Then, make sure the card number, expiration date, and security code were all entered correctly. If you're still having issues, please contact us and we will help you as best as we can. Do I have to create an account to order from Extang? No, you may checkout as a guest. However, if you do create an account you can view your order history as well as check the status of your order at any time. How do I update my profile information on my account? Once you have logged in to your account, you can select "Account Details". There you will have the options to alter billing information, shipping information, your username or password. How do I sign up for newsletters and promotions? Scroll to the bottom of the homepage and in the footer section you will see " Subscribe to our Newsletter" just fill in your email address and you are all set! Each promotional e-mail that we send from Extang will include an "unsubscribe" link for your convenience. You can also change your preferences in your account, or give us a call and we can take care of that for you. You can log into your account to check the status of your order, contact customer service. Well also send you an email with your tracking information once your order has shipped. Will you let me know if an item is on out of stock and what are my options? In the case that an item you have ordered is out of stock, our customer service team will reach out via email to notify you. At that time if you wish to cancel your order, wait until it's in stock, or exchange for a different item our team can assist with that request. Will you let me know if my item has shipped? Yes, you will receive an email with your tracking information once your order has shipped. Also you may check your account to get your order status and tracking number. To cancel an order, we suggest contacting our Customer Service Department. Due to the speed in which we process orders, cancelling an order or an item within an order is extremely difficult. While we will treat your request with top priority, it may take 24-48 hours to confirm your request and there is a good chance that your package will already be on its way. If your order has already been sent to a shipping warehouse, you will need to return the merchandise through our normal Returns Process. There a couple ways to track your order. You will receive an email with tracking information once your order has shipped. You may also check your Account area. Also you can contact our Customer Service Department and someone can help you with that information. I need to return my purchase. Where do I begin? Please check that your Extang product has been received in good condition. If your product has been damaged in shipping, a damage report must be reported within 3 business days of receiving your item. If a damaged item received is reported after 3 days, Extang cannot settle any shipping damage dispute. Please retain all packaging material your Extang product was received in, should FedEx have to inspect the item for a claim. FedEx will not settle any claim unless the original packaging can be inspected at the site of where the shipment was received. If the item you received was drop shipped by Extang for one of our distributors and was received damaged, please contact us or the company from whom you bought the product immediately. If you have received an incorrect item, please contact our customer service department at 800-877-2588 with the information of whom you purchased your product from and we will arrange to have the item picked up and replaced for you. You may email info@extang.com If you have attempted to install your Extang product, or any Extang product has already been installed on your vehicle, EXTANG will not accept any return. All Extang items have to be returned unused, in the same packaging in which they were originally received with all labels and packing materials included. Extang has a limited warranty on all products which covers manufactures defects in materials or workmanship. Random acts of god are not covered in any capacity under the Extang limited warranty period. In the event you decide you do not want the EXTANG product you have purchased and it has not been installed, and is still in the original packaging, you have the option to return the product at your expense. Extang will charge a 20% restocking fee for all such items being returned to stock. Extang will not accept any items back without an approved RMA #. Please have whomever you purchased your item from, obtain an RMA # prior to returning the item. Any item returned without an approved RMA # will not be accepted. In the situation that you are dissatisfied with your purchase. The customer is responsible for returning the merchandise back to our facility. Please Note: An additional 20% restocking fee can also incur in these scenarios. Please allow 10-14 business days to either receive a replacement item and or a refund. All orders placed online at extang.com can be returned to: 5400 S. State ST. Ann Arbor, MI 48108 To return the merchandise you will need to contact Extang customer service to receive a RMA number. I received the incorrect item what do I do? If you have received an incorrect item, please contact our customer service department at 800-877-2588 with the information of whom you purchased your product from and we will arrange to have the item picked up and replaced for you. My item was damaged in shipping, what do I do? Please contact customer service or call us at 1-800-877-2588 Mon-Fri 8:30am- 7pm EST. Please note if your order was delivered by freight carrier, you will need to inform the driver or note the invoice of any visible damage. My order was lost in transit, what do I do? Please contact customer service at 1-800-877-2588 Mon-Fri 8:30am - 7pm EST. How and when can I contact customer service/support? You can contact customer service at 1-800-877-2588 Mon-Fri 8:30am - 7pm EST., or by emailing us at info@extang.com. My order shows as having been delivered, but I don't have it. What should I do? Although it is rare, occasionally an item will show as delivered, but you did not receive it. If this happens, please call our Customer Service Department 1-800-877-2588 Mon-Fri 8:30am-7pm EST. We can investigate the issue further and may show a location (front door, garage, side door, neighbor) on the delivery receipt, as well as a signature if one was received. If you are still unable to locate the item, we will file a lost package claim on your behalf with the carrier. They will then take steps to locate your item. In most cases, the item is located within 2-3 business days. If after an investigation the item is indeed lost, Extang will reorder all lost items for you. Where can I find the part number for a specific product? To find a specific part number on our website, please choose a product, then select your year, make and model of your vehicle. Once the select has been made the part number will appear underneath the product description. Yes we charge tax on orders located in MI. Yes, we do ship outside of the USA. International charges will be incurred for non-continental USA shipping. Due to the size of our products, orders can not be shipped to PO or Military APO/FPO addresses. Do you ship to AK, or HI? Yes we do ship to Alaska and Hawaii. Additional shipping fees will be incurred for all non-continental USA shipping. What if I am missing a part for my Tonneau cover what do I do? If you were missing parts when you received your cover, call Extang immediately, please do not return product to the retailer. Our Customer Service Department will be able to assist you in an expedient manner. When did Extang open for Business? Extang began manufacturing tonneaus in 1982. Where are Extang Covers made? All Extang covers are made in the USA, manufactured at our Ann Arbor, Michigan facility. How can I be assured that I am buying a Quality Product? Extang supports all of our products, 100%, with the industry's strongest warranty: the Maximum Strength Warranty. In addition, we are a certified ISO9001:2008 facility for quality standards. Will a Tonneau Cover Improve my gas mileage? 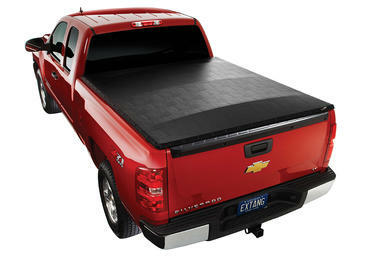 Installing a tonneau cover to your vehicle will help reduce aerodynamic drag and therefore improve MPG. 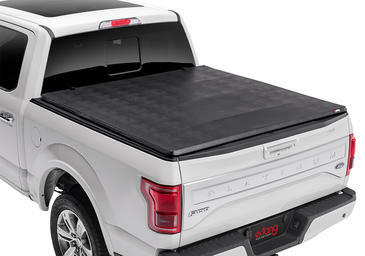 Industry testing has shown gas mileage improvements of up to 10%, which means that Extang tonneau covers essentially pay for themselves! I have an older truck and I don't see my year. Can I still get an Extang cover for my truck? We are not currently producing any custom tonneau covers. Please call us to inquire about future availability of your application. How can I locate the part number of my tonneau? The part number is typically 10-11 digits, stamped along the underside of the cover, typically located at the driver side cab corner. On hard covers please look for a white sticker to locate the UPC number. Can I still open my tailgate with an Extang Tonneau on my truck? 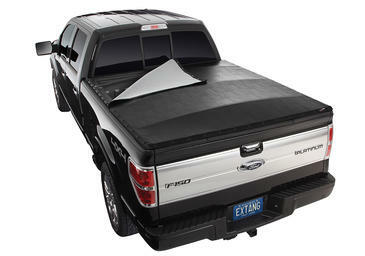 Yes, Extang tonneau covers do not restrict the tailgate in any way. How far above or below the rail does the Tonneau sit? Most Extang tonneaus sit about an inch above the rail. How do I care for my vinyl tonneau cover? Extang recommends that our vinyl tarps be cleaned with a mild soap, water and a medium bristle brush. If you choose to use a vinyl conditioner, be sure to use our TONNO TONIC. Many other vinyl conditioners contain chemicals that can actually damage your tarp. TONNO TONIC bonds molecular to your Extang Tonno to give it that brand new look day after day. 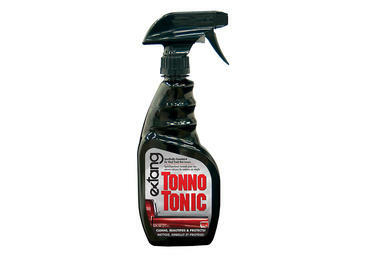 TONNO TONIC will not attract dust nor will it coat or seal your cover. TONNO TONIC allows your tonno to breathe naturally, while enhancing the appearance and providing additional UV protection. Can I drive through a car wash with an Extang Tonneau Cover installed? Yes, automatic car washes are safe, however you will not want to select any type of wax treatment as the ingredients within the wax treatment could potentially harm the finish built into the cover. How do I care for my Signature Series Tonneau? We recommend RaggTop made by Wolfstein's Pro Series to treat the Signature Series material. How do I care for my Hard Trifold? Extang recommends that our hard folding covers be cleaned with soap, water and a medium bristle brush. You may use a product like Meguire's Quick Detailer to protect and preserve the finish of your tonneau without streaking. Can I get replacement parts for my Tonneau Cover? Replacement parts are available directly from Extang. Simply contact our Customer Service Department to take care of your parts needs. We can accept an order over the phone using any major credit card (Visa, MasterCard, Amex or Discover) or you can send in a check or money order prior to placing your order. What is the price for a replacement vinyl cover for my Tonneau? Replacement vinyl covers run $99 plus additional shipping & handling charges. There aren't any tonneau covers on the market today that are 100% waterproof. We consider our covers weather tight and use application specific rubber seals to create superior sealing against water and dust. Our tonneaus are built to be weather tight against normal rain and car washing situations. 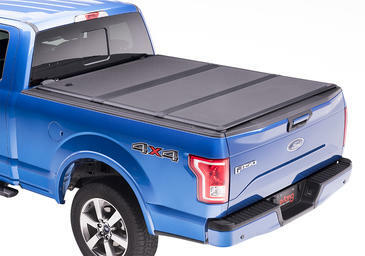 Are Extang Tonneau Covers difficult to Install? No, the average installation for a retail customer usually takes 30 to 40 minutes or less (professional installation will take 10-15 minutes). No drilling or tools are required except for an Allen wrench on some applications or a ½ inch socket wrench on Encore. Anything you will need to perform the installation is included in the box. How do Extang Tonneau Covers attach to the truck? All Extang tonneaus are no damage, no drilling, clamp-on, top mount designs. 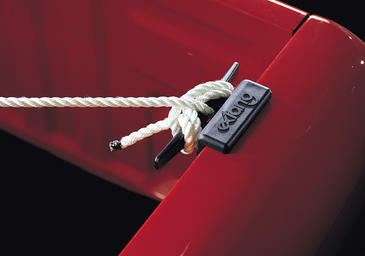 There are clamps along each side of the tonneau, which grab the lip of your truck bed. Our clamps and rails are produced with seals along the parameter of the rail, so there is no metal-to-metal contact. Completely padded so that there is no damage to the truck. On all traditional and rollup tonneaus, Extang offers a lifetime frame warranty against defective materials or workmanship (all tonneau rails, aluminum components, clamps, bows, hardware) and a 10-year tarp warranty on defective materials or workmanship on the vinyl covering. For the Trifecta, Extang offers a lifetime frame and tarp warranty against defective materials or workmanship. On the EnCore and Solid Fold 2.0 tonneaus, Extang offers a 3-year warranty against defective materials or workmanship. What are the conditions of the warranty? Warranty coverage is against defective materials or workmanship. The warranty is void if the product has been damaged by accident, unreasonable use, neglect, improper service/installation/removal, modifications, acts of God, normal wear and tear or other causes not due to defective materials or workmanship. Consequential and incidental damages are not covered under this warranty. Wind whip damage: Tarps must be secured at all points when vehicle is in motion. An unsecured tarp will flap, resulting in damage to the fabric. Improper cleaning: Recommended use of the tested and approved Extang Tonno Tonic or clean with mild soap and water only. Do not use vinyl conditioners (i.e. Armor All®) because they will shrink the vinyl. Overloading of cargo: Cargo should not touch the tonneau at any point. Protrusions in the tarp will stress the fabric. 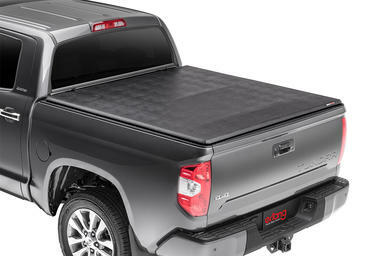 Cargo may shift while traveling and push against the fabric, causing damage to the tonneau. Is the Tonneau Warranty transferable if I sell my truck or the tonneau? No, the warranty applies to the original consumer/purchaser for the truck on which the tonneau was originally installed, and shall not apply if the product has been removed from the original vehicle. What information do I need to have if I encounter a problem? To qualify for warranty, you must provide proof of purchase, part number of your tonneau, and the lot code (found on the underside of the cover) in order to make a warranty claim. Or, you must have registered your warranty (to fulfill these requirements). How easy is it to remove the BlackMax Cover? 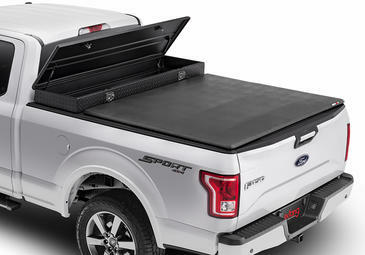 Both snap covers are designed to roll up quickly against the cab and be secured with strong, convenient straps to allow full access to the bed. Our Clicklock (Classic) and Leverlock (Blackmax) style corners allow you to attach or remove the tail rail instantly, without any tools. The Monster Bows are spring loaded and can be removed or installed easily with one hand. I have a truck with a utility track system in the bed. Can I still use the BlackMax Tonneau Cover? 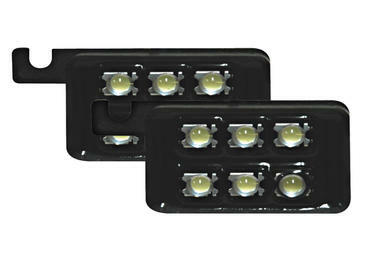 Yes, the installation of a Blackmax or Classic Platinum will not interfere with your track system. The covers allow for full use of the system. Will the BlackMax work in the Winter as well as in the Summer? Yes, each cover has an exclusive patented all-climate engineered design to 4-way adjustable for cold weather. The Tuffklamps allow for two bow heights: HIGH for maximum water shedding in harsh weather and for improved gas mileage, and LOW for cold weather tonneau attachment. The MaxSnap slides have two settings: stud low for tight tarp fit in hot weather or stud high for looser tarp fit in cold weather. Will the BlackMax work with my other truck accessories? Each cover is designed to work with many aftermarket truck accessories and will fit with all types of bedliners, most bedcaps and 5th wheel hitches. How do I adjust the tension on my tonneau cover? To adjust the tension on each cover, you can adjust the bow height to the high setting on the TuffKlamp for a tighter fit or the low setting for a looser fit. The MaxSnap slides can be stud low for a tight tarp fit or stud high for a looser fit. How far above or below the rail does the BlackMax sit? These covers are designed to sit 1 inch above the bed height, directly on top of the bedrail. Can I drive with my Tonneau opened? Yes, unsnapped and rolled at the cab. The vinyl cover must be rolled up to the cab and secured with the Velcro straps. Do I need to drill my truck when I install my cover? Absolutely not. No. All of these applications have a 100% no drill, no damage installation. How long does it take to install my BlackMax Cover? It takes most customers 30 to 45 minutes to install these covers. What's the difference between the Classic Platinum and BlackMax? The Classic Platinum has silver-color rails with silver snaps, which slide freely in the rail, while the Blackmax uses all black components. Additionally, the Blackmax cover snaps around the entire tarp, whereas the Classic Platinum only has snaps on three sides and slides into the cab rail on the 4th side. How easy is it to take the Encore cover off? 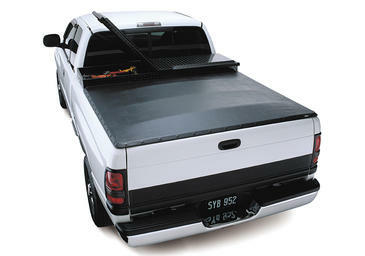 The tonneau can be removed from the bed/rails within minutes. Will the Encore work with a drop in bed liner that goes over the bed rails? The bedliner must be an under-the-rail liner, as any over-the-rail liner will interfere with the installation. I have a truck with a utility track system in the bed. Can I still use an Encore? Yes, for a few select make and models. What are the Encore panels made of? Extang's exclusively designed panels feature EnduraShield skinned panels paired with a polypropylene core for a superior alternative to the traditional aluminum panel. The EnduraShield skin is constructed from a automotive grade polymer that resists denting, scratches, and UV induced fading. How much does the Encore weigh? Depending on the vehicle application it will weigh 50-75 lbs. The Encore offers a 3-year warranty from the date of purchase. Can I stand on my Encore? Yes, however it is not recommended. Does the Encore Tonneau Lock? Yes, as most styles of Encore offer the bolt lock at the cab panel. How easy is it to take the Express cover off? 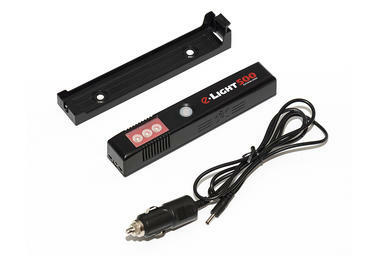 It is extremely easy and user friendly. Simply roll the tarp to the cab and secure the cover with the supplied buckles. You can release the cab rail with the release lever located on the passenger side. Will the Express work with a drop in bedliner that goes over the bed rails? If the bed liner goes over the side rails, it will need to be trimmed/notched. How do I adjust the tension on my Express Tonneau cover? The Express is equipped with an automatic tension system. Yes, you can roll the vinyl cover and keep it secure at the cab. Do I need to drill my truck when I install my Express? No. The Express is a no drilling/no damage tonneau installation. How long does it take to install my Express cover? How easy is it to take the Full Tilt cover off? The cover can either be unsnapped and rolled to the cab, or the entire cover with side, cab and tail rail can be removed as one piece. Will the full Tilt work with a drop-in bed liner that goes over the bed rails? 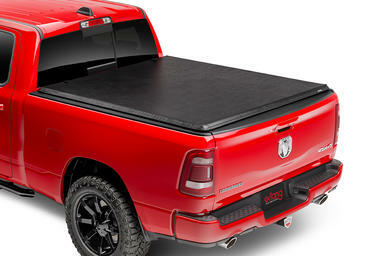 This tonneau will work as long as the bed liner is an under-the-rail bed liner. I live in a region that gets a lot of snow. Can the Full Tilt hold the snow without bending or stretching? Yes, however we recommend that you remove the snow from your tonneau just as often as you remove the snow from your windshield. I live in a region that is very hot. Will the Full Tilt fabric fade in the sun? No, however it is recommended that you apply Tonno Tonic to the vinyl fabric. 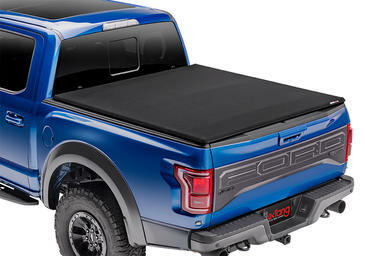 How do I adjust the tension on my Full Tilt tonneau cover? The sliding rail snaps can be reversed for either the tighter or looser position. Or, you can adjust the bow positions to the higher clamp position (to tighten the tarp) or the bottom clamp position (to loosen the tarp). How far above or below the rail does the Full Tilt sit? It sits 1 inch above the rail. 10 years on the vinyl cover and lifetime on the frame/components. How easy is it to remove the Revolution Cover? It is quite easy and user friendly. The Revolution offers a quick removal operation. Once the cover is rolled and secured at the cab, you can remove the cover and cab rail in one step. How easy is it to take the Trifecta 2.0 cover off? Extremely easy, simply release the clamps at the tail, fold the cover and loosen the clamps at the cab for quick and easy removal. 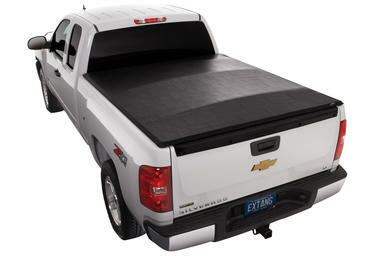 Will the Trifecta work with a Drop-in Bed Liner that goes over the bed rails? To perform the installation, simply notch the areas where the clamps will be positioned. The clamps must be flush against the metal of the truck. I have a truck with a utility track system in the bed. Can I still use a Trifecta 2.0? Yes. The Trifecta comes equipped with a supplemental clamp kit used to mount inside the track system. Will the Trifecta work with a 5th Wheel? Yes, it should work without any issue. Will the Trifecta work with my other truck accessories? 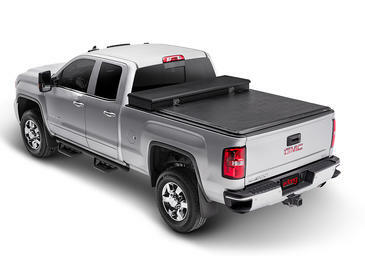 Some aftermarket truck accessories do affect the tonneau installation. Please contact our customer service team for further details. How much does the Trifecta 2.0 weigh? Can I drive with my Trifecta Tonneau while open? The Trifecta tonneau must be fully folded and buckled at the cab. You cannot drive with this tonneau partially open/folded. How long does it take to install the Trifecta 2.0 cover? The Trifecta takes longer to remove from the box, than it does to install on your vehicle. This tonneau installs within minutes. The Trifecta carries a lifetime warranty. How easy is it to remove the Tuff Tonno cover? The vinyl cover can be rolled up at the cab and secured with the Velcro straps under the cab rail. You can simply remove the cab rail to fully remove the cover from the bed. 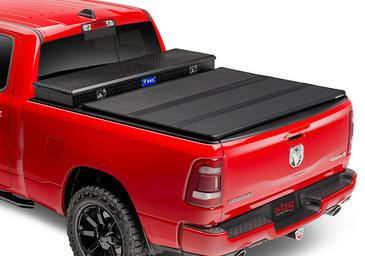 Will the Tuff Tonno work with a drop in bed liner that goes over the bed rails? Yes. If the liner attaches over the side of the bed, you will need to notch the liner to accommodate the clamps. The clamps must be flush against the metal of the truck. I live in a region that gets a lot of heavy snow. Will Tuff Tonno hold the snow without bending or stretching? I live in a region that is very hot. Will the Tuff Tonno fabric fade in the sun? I have a truck with a utility track system in the bed. Can I still use a Tuff Tonno? Yes, the tonneau clamps will mount under the side rails. Will the Tuff Tonno work in the winter as well as in the summer? Yes, the Tuff Tonno comes equipped with a rotating tail rail, which allows for easy tarp installation and removal. Will the Tuff Tonno work with my other Truck Accessories? Unfortunately, some aftermarket truck accessories can interfere with the installation of this tonneau. You may want to contact our customer service team to confirm that it will work with your specific accessories. How far above or below the rail does the Tuff Tonno sit? The rails sit about 1" above the rails. Can I drive with my Tuff Tonno opened? Yes, as long as the vinyl cover is rolled up and secured at the cab (with the Velcro straps). Do I need to drill my truck when I install my Tuff Tonno? No, the Tuff Tonno is a no drill/no damage installation. All parts required to perform the installation are included in the box. How long does it take to install a Tuff Tonno Cover? Not long, at all. 20-30 minutes max. The Tuff Tonno warranty is 10 years against the vinyl tarp and lifetime against the frame/components. How easy is it to take the Solid Fold 2.0 cover off? The Solid Fold 2.0 offers quick and easy installation and removal. Simply release the clamps at the tail, fold the cover and loosen the clamps at the cab. To perform the installation, notch the areas where the clamps will be positioned. The clamps must be flush against the metal of the truck. Yes. The Solid Fold 2.0 comes equipped with a supplemental clamp kit used to mount inside the track system. The Solid Fold 2.0's exclusive, lightweight, 1-inch thick EnduraShield panel features an automotive grade polymer skin with a polypropylene core to provide the ultimate protection from dent and scratch resistance as well as UV fading. The Solid Fold 2.0 weighs 50-75 lbs, (depending on the application). Does the Solid Fold 2.0 cover lock? The Solid Fold 2.0 does not offer a locking mechanism, however if you have a locking tailgate your bed is thoroughly secure. 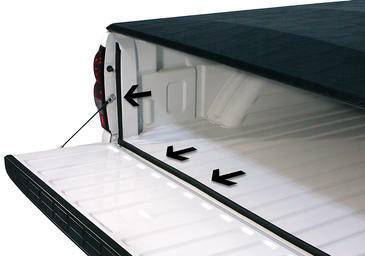 Once the tonneau is installed, you must lower the tailgate to access the bed. Can I drive with my Solid Fold 2.0 open? Not while unsecure. The Solid Fold 2.0 must be fully folded and buckled at the cab. You cannot drive with this tonneau partially open/folded. How long does it take to install the Solid Fold 2.0? The Solid Fold 2.0 takes longer to remove from the box, than it does to install on your vehicle. This tonneau installs within minutes. The Solid Fold 2.0 carries a 3-year warranty from the date of purchase, to the original purchaser/owner. The Solid Fold 2.0 UTV Edition offers quick and easy installation and removal. Simply release the clamps at the tail, fold the cover and loosen the clamps at the cab. 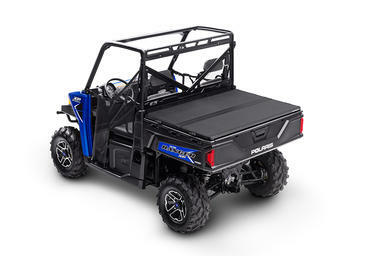 What is the warranty for the Solid Fold 2.0 UTV? The Solid Fold 2.0 carries a 90-day warranty from the date of purchase, to the original purchaser/owner.